I know, I know, the picture is awful. I had to snap a quick pic with my phone while at the dungeons and dragons game before they were all gone. So no spiffy camera action today. My DnD group has an interesting conflict of dietary needs. On one side we have a vegetarian, which to me is easy to cook for. On the other side we have its evil nemesis the atkins dieter. Boo! (hehe) To be honest I don’t pay attention much to carbs so this is a bit of a challenge, to make something not uber in carbs but not filled with meat or sneaky meat additives (jello, you know who you are. )…and most of all something tasty. I like to bake for gaming groups I belong to so this required much thinking. This has been my first success. It’s really just a jazzed up old kraft peanut butter cookie recipe. Both vegetarian and atkinarian (oh yeah, I made up a word, deal) were able to snack on these and live happily ever after while we got smacked around by the stuff a really annoying vampire summoned up. Jerk. Combine almond butter, splenda and egg until well mixed. Form the dough into 26 little balls, flatten with a fork slightly. Bake at 325F for 15 minutes. This makes 26 cookies. Each cookie contains 61 calories, 5 grams of fat, and 1.2 grams of fibre. For those curious on those carbs they ended up being 1.5 carbs each. Considering these are a super rich cookie a couple will do you. I love how you don’t have to eat a ton of these to feel like you had dessert. 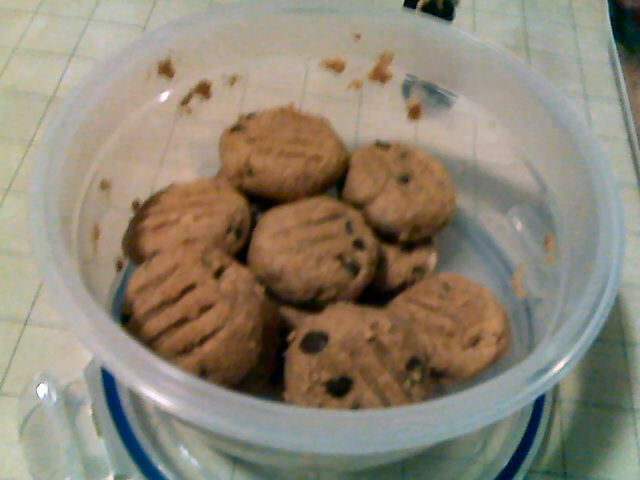 If you want to lower the fat I do the same recipe with light peanut butter and they turn out soooo good. I couldn’t use my light peanut butter for the atkins dieter because for some reason light has more carbs than full fat almond butter…go figure. This entry was posted in Craving Buster, Dessert, Snack and tagged almond, chocolate, vegetarian. Bookmark the permalink.